Submitting yourselves one to another in the fear of God. Wives, submit yourselves unto your own husbands, as unto the Lord. For the husband is the head of the wife, even as Christ is the head of the church: and He is the saviour of the Body. Therefore as the church is subject unto Christ, so let the wives be to their own husbands in every thing. Husbands, love your wives, even as Christ also loved the church, and gave Himself for it; That He might sanctify and cleanse it with the washing of water by the Word, That he might present it to himself a glorious church, not having spot, or wrinkle, or any such thing; but that it should be Holy and without blemish. So ought men to love their wives as their own bodies. He that loveth his wife loveth himself. For no man ever yet hated his own flesh; but nourisheth and cherisheth it, even as the Lord the church: For we are members of His Body, of His Flesh, and of His bones. For this cause shall a man leave his father and mother, and shall be joined unto his wife, and they two shall be one flesh. This is a great mystery: but I speak concerning Christ and the church. Nevertheless let every one of you in particular so love his wife even as himself; and the wife see that she reverence her husband. 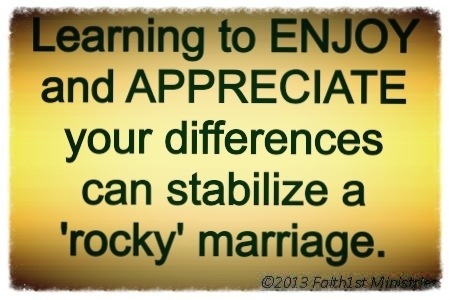 And if your marriage is built on the Rock respecting differences comes a little easier. i have often said the thing about the differences between my wife and I is that it would terrify the world if she WAS like me!